Replace that voice in your head with a digital assistant that can read out email, control smart home devices (switches are so 2010), and book Ubers. If you really like it, you can get yourself a Kai by backing its Kickstarter campaign. One way to create smart eyewear is to manufacture the hardware yourself and control not just functionality, but also the build. That was the approach Vue took, and it managed to raise over $2.2 million on Kickstarter. So that seems to work. Another way to do it would be to create a device that can be retrofitted to any pair of glasses to integrate smart features instantly. That’s the route a new wearable called Kai is taking, and it has also turned to Kickstarter to get the monetary nudge it needs to go into production. Kai (pronounced like the ‘Kai’ in King Kai, of Dragon Ball Z fame) is a wearable device with a digital assistant built into it. The device’s features are totally independent of where you wear it (as long as it can process your voice), but it’s being marketed as a smart glass accessory because it clips onto spectacle frames. Once there, it can be used to access a slew of smartphone features using nothing but voice commands. Unlike more advanced smart glasses like the Vuzix, Kai doesn’t mess around with augmented reality features. Instead, the focus is on using your smartphone without having to actually have it in your hands all the time. The Kickstarter promo video showcases the many things the device simplifies thanks to its powers of speech recognition and language processing. In it, a user turns on the lights, has his schedule for the day read out to him, and gets a weather update using Kai. The digital assistant reads out notifications and messages, and can also be used to type out messages or place calls. 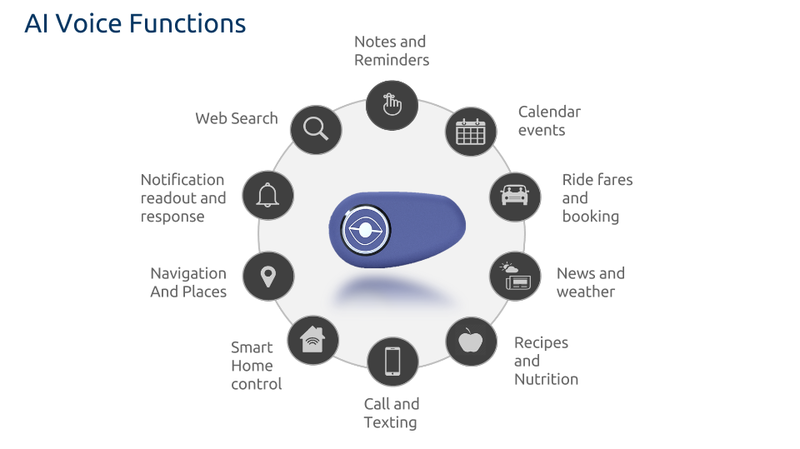 The feature-set is pretty extensive and includes smart home control, booking Ubers, and Wikipedia searches. The voice-based interface Kai uses is powered by Houndify, which is why it uses the wake phrase “OK Hound” (the team is experimenting with custom wake-phrases). Houndify is a platform using which voice-enabled artificial intelligence features can be added to any device or software. Its speech recognition and conversational intelligence modules are integral to the various services delivered by Kai. The partnership could lead to Kai supporting more advanced features as Houndify introduces some additional capabilities which are in beta (including emotion detection and automatic language translation). Kai has raised $19,000 on Kickstarter so far with the goal of reaching the very specific $55,650 mark by the time the campaign ends in about less than a month. Only five of the super early bird units priced $130 remain. If that reward tier runs out, you can get yourself one for $150. The Glimpse Wearables website is currently offering a $70 discount off the eventual retail price for signing up to its mailing list. $150 might not be a bad price to pay for something that is that cool. Sure beats trying to get Google Glass to make sense at $1500. Very nice and probably the reason that Google knew the Glass was not going to go anywhere.